I made y’all another video!! 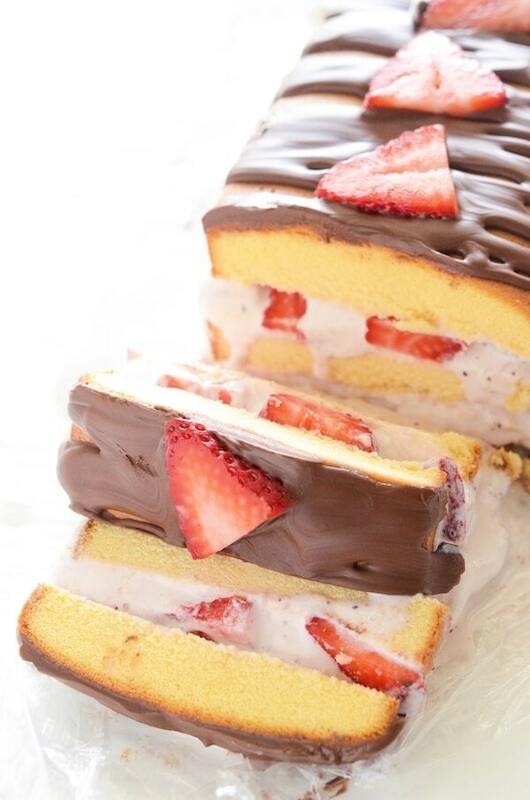 This time for a Strawberry Ice Cream Cake! 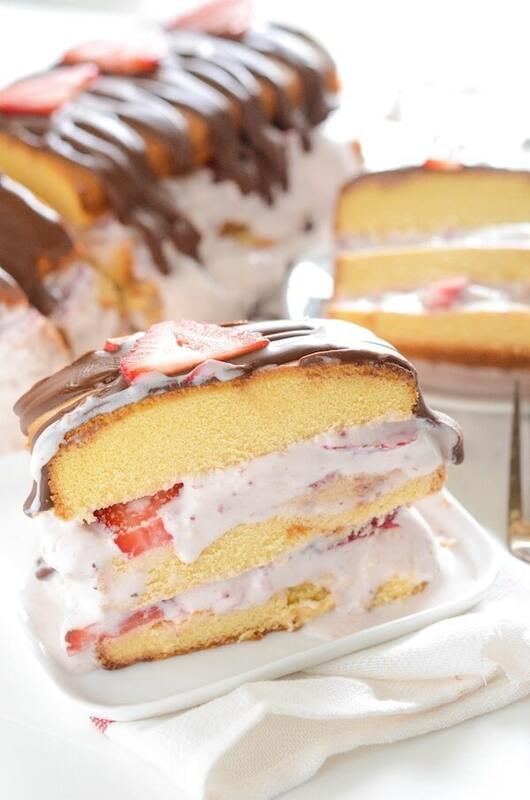 A crazy easy recipe using store bought pound cake, strawberry ice cream, fresh strawberries and chocolate!! Do you ever suddenly remember something you ate as a kid and have to have it again? It happens to me often — usually with cereal. But this time, it was ice cream cake…a sweet Strawberry Ice Cream Cake to be specific. Growing up I had an ice cream cake from TCBY for every single birthday. I am not sure when it stopped, but I miss them immensely. Who wouldn’t love ice cream and cake combined?? We don’t have any TCBY’s around where I live these days and so I decided to make my own ice cream cake. I used a store bought Sara Lee pound cake, strawberry ice cream, fresh strawberries and chocolate shell topping to finish it off. The cake takes about 10 minutes to toss together and needs about an hour to harden before you serve it. I almost skipped the chocolate topping on top, but I am so glad I included it. 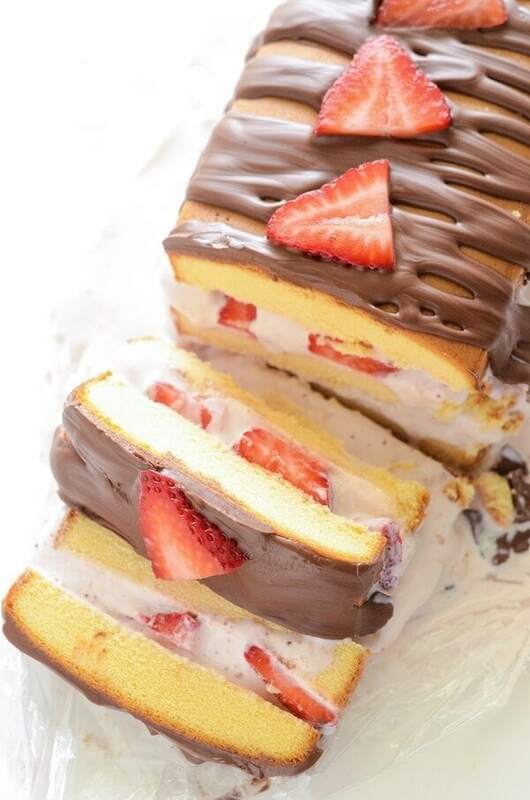 Getting a bite of chocolate, pound cake, strawberry and ice cream all in one cold bite is perfection. If you aren’t a fan of frozen strawberries (I love them if they are sliced super thin), you can also substitute the strawberries for Strawberry Ice Cream Topping — you can find it in the grocery store next to all the other ice cream toppings. It adds plenty of strawberry flavor and you won’t have any frozen berry texture. Also, if you are up to the extra work, you can absolutely make your own Dark Chocolate Magic Shell topping. All you need is chocolate and coconut oil to make your own! I hope you enjoy this Strawberry Ice Cream Cake as much as my family and I did! We had spent an entire afternoon outside in the Florida heat and this was the perfect dessert to enjoy together after dinner!! Slice pound cake into three even slices. Line pound cake metal container with saran wrap. Place first layer of pound cake back into prepared container. Add two cups ice cream and spread into an even layer. Top with sliced strawberries (or strawberry ice cream topping). Repeat layers again, then top with remaining slice of pound cake. Wrap tightly in saran wrap and freeze for at least 1 hour. Remove from freezer and remove saran wrap. 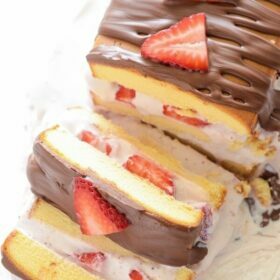 Drizzle cake with chocolate shell ice cream topping and quickly top with fresh strawberries as the chocolate shell hardens quickly. I could watch your video all day long! This cake looks incredible! I used to love TCBY, too! I haven’t seen one in years! Love how quick and easy this ice cream cake is! Perfect for lazy summer days! SUCH a gorgeous cake! I love that it was inspired by TCBY birthday cakes of yore, and I’m sorry you don’t have a TCBY by you. My mom always made ice cream cakes for us for our birthdays, and I’ve yet to be able to recreate it. That said, I could totally make this. And since strawberries and chocolate and ice cream are some of my favorite things, it would be well-loved in this house! This looks incredible! I LOVE all the layers and the fact that it’s so super easy! So easy and delicious! New family dessert in this house! Okay, this is getting served at my 4th of July party! You always have such great recipes. I love using strawberries in desserts! This looks like a fantastic recipe! I can’t believe how easy this is, and it looks wonderful! I am now excited about your dessert. 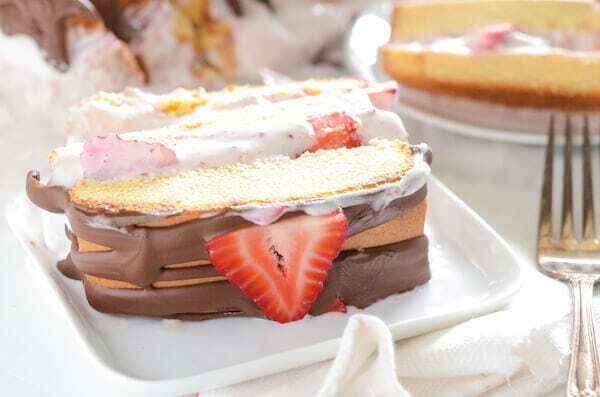 its first time I heard about this cake with strawberry. your post is more helpful because of the video you shared. Its a very nice post apart from others. Thank you so Jessica.